This is relatively interesting information from Wikipedia about the Seoul Subway Line 2, or the green line. It is a circular line and I have spent many many hours on it, always seemingly coming away from or towards Shinchon (I still use the old spelling). 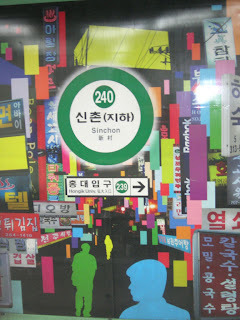 I got to familiarize myself with it, from a different angle altogether, when we moved to Gangnam that last year. It felt nicer south of the river for some reason, not unlike a lot of Seoul.